This vegetarian one-pot dish makes an easy supper - just leave it to cook while you get on with other things. 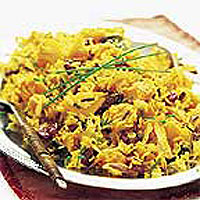 The tender rice and squash combine beautifully with nuts and tangy dried cherries (from the fruit and vegetable section). This recipe serves two generously, but can be easily doubled for four. Cut the squash in half and discard the seeds. Peel, then cut the flesh into bite-sized chunks. Add the saffron to the hot stock and leave to infuse for 10 minutes. Meanwhile, heat the oil in a pan with a tight-fitting lid. Add the onion and fry gently for 5 minutes until softened. Add the sage leaves, Brazil nuts and rice and fry for a further 2-3 minutes to coat in the oil. Stir in the squash, cherries and saffron stock, then season and bring to the boil. Stir well, then reduce the heat. Cover and simmer for 20 minutes, or until the rice and squash are tender. Reserve 3 chives and snip the remainder into the pilaff. Stir well, then taste and add more seasoning if necessary. Pile the pilaff onto a platter or serving dish and serve garnished with the reserved chives. Replace the squash with 300g chestnut mushrooms, halved, and 1 red pepper, chopped.